Yatzy is a sequence dice-casting game similar to Yacht and Yahtzee. The game is played mostly in Scandinavian countries where it is as popular as Yahtzee in America. Yatzy is very similar to American Yahtzee with a couple of additional categories and slightly different scoring mechanism. 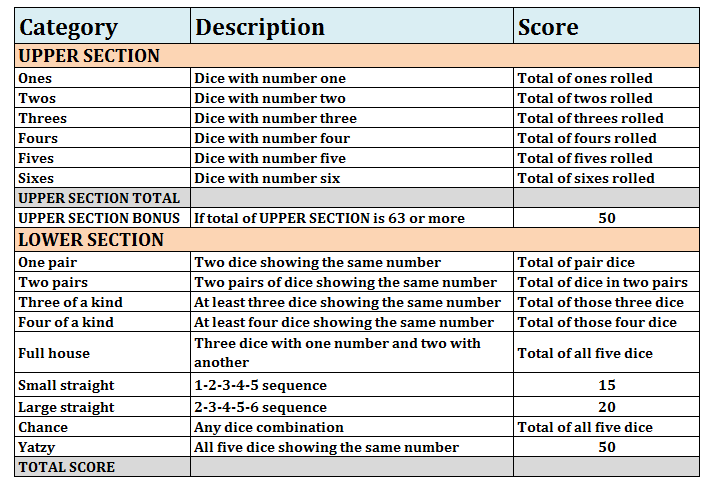 The game has 15 categories to score which are divided between two sections; UPPER SECTION and LOWER SECTION. Each category can be scored only once. Categories can be scored in any sequence. There are 15 rounds in the game. Players can score in one category in each round. Players take turn to roll 5 dice in each round. After each roll the player can set aside one or more dice and then roll remaining dice. A maximum of 3 rolls are allowed to all players in each round. All five dice are available to be thrown anytime in a roll including the ones which were set aside in previous rolls. UPPER SECTION has a bonus of 50 if players score 63 or more in it. Some combinations can be scored in more than one category. For ex, a Full house can be scored in Full house, or Three of a kind, or Chance, or One pair, or Two pairs. If players can not score in a category, they can still mark it for a score of zero. Once all categories are played, the player with the highest score wins.